Nexus 6P first impressions(P is for Premium). So far it is the best phone of 2015. Filed Under: Android News by Android NewsPad — Comments Off on Nexus 6P first impressions(P is for Premium). So far it is the best phone of 2015. It is really difficult to tell how great a phone is at a press event. As a writer, we literally get a few hours max to spend with the newest devices while fighting off other media outlets. I attended the Google press event for the Nexus releases, and my first impressions of the 6P were positive, but I rarely ever like to make judgements without spending quality time with a device. It’s in my nature to study and try things out before I make judgements as I am a Medicinal Chemist at a Biotech in San Diego(yes I can make methamphetamine like Walter White in Breaking Bad, but I enjoy a prison free life so no I will not ever make it). I was taught to make decisions using the Scientific Method which is a process to acquire new knowledge. Yes, I know, I am a super nerd but I am cool with it. 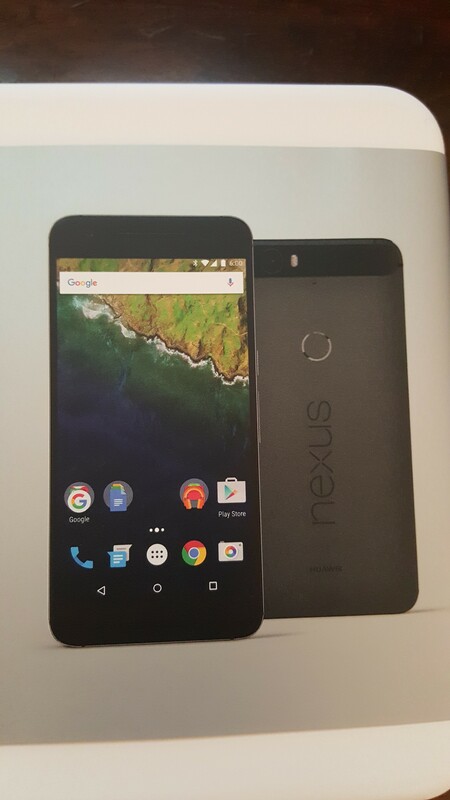 I received the Nexus 6P at 9:20am on the morning on Friday Oct. 16th and got into work late because of it. I had to make up that time this weekend. I was simply excited like any other Nexus fan and once I opened the box, I knew I had something special. It’s been a long time since a device has got me this excited, I was like a fat kid running free in a candy shop with no parents around. Let me explain why. Nexus 6P unboxing. Google provides a USB type-C to USB type-C cable and type-C charger plug. Under the plug is a standard USB to USB type-C plug. The first thing we naturally do as humans, is make an initial judgement on how something looks and this Huawei made Nexus 6P is really good looking. If this were a prom dance, the Nexus 6P would nominated for royalty for its looks alone. As a Samsung fanboy, I learned a hard lesson this year about how much people care about the materials used to build smartphones. Samsung radically changed their designs and put beauty over function in their latest metal and glass covered Galaxy devices which broke my heart. 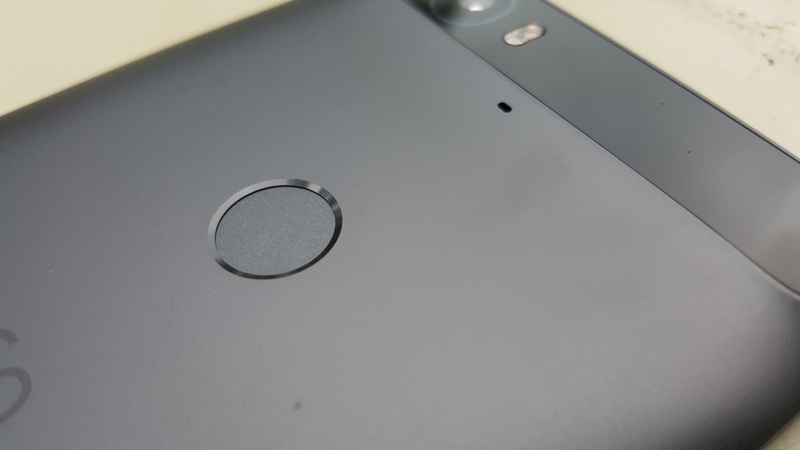 Huawei and Google spared no expense when it came to build materials on the Nexus 6P. It is made out of aeronautical-grade aluminum and comes in three colors – aluminum(non-painted metal), graphite(anodized or powder-coated dark gray color) and frost(also known as white). Google sent me a graphite colored device, and frankly I love it. 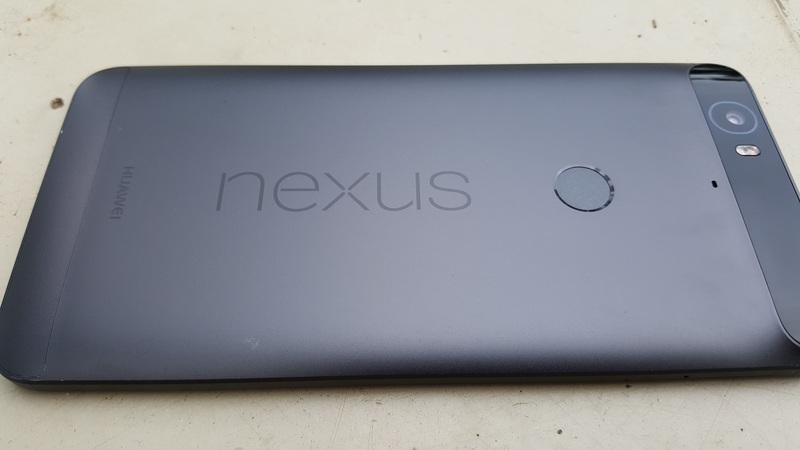 I saw the aluminum and frost colored Nexus 6P’s at Google and they are all stunning. I really would have been equally happy with any of those colors. 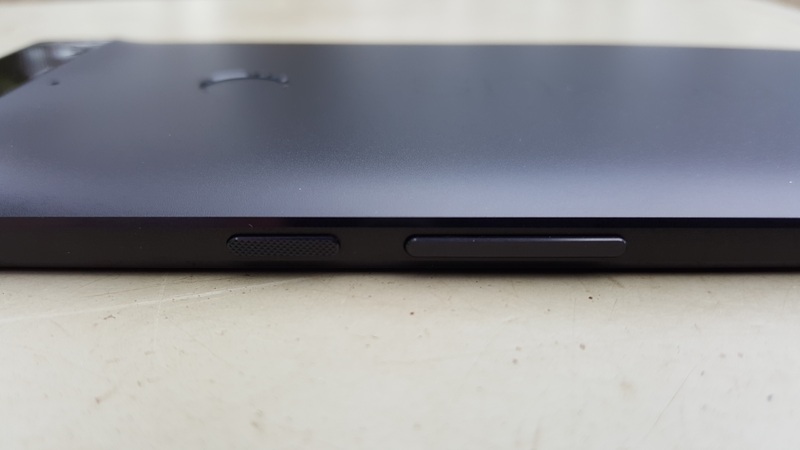 On the sides of the Nexus 6P are chamfered edges which is a similar design to the Samsung Galaxy Note 4. The all metal body measure at 159.3 X77.8 X 7.3mm, which in comparative terms is very similar to the Samsung Galaxy Note 5 in size and feel. Although being that the Nexus 6P is made of all metal, it feels much less fragile than the Note 5 and feels very much like a combination of a Note 4 and HTC One M7. Nexus 6P textured power button with volume rocker. Also notice the chamfered edges. 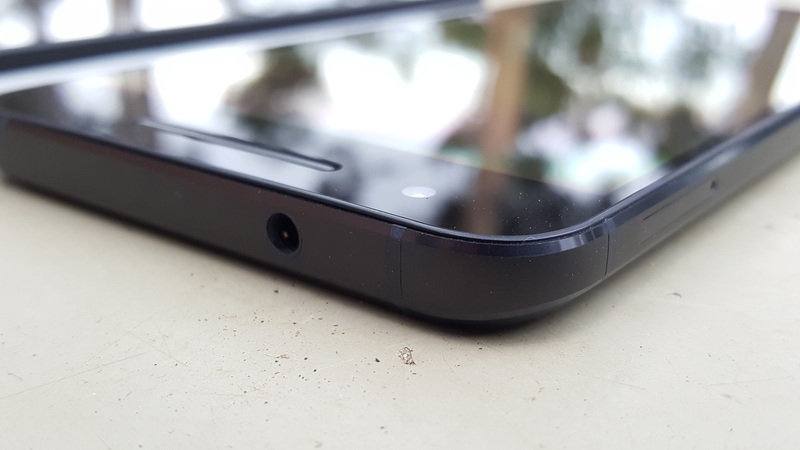 On the front of the phone are dual front-facing speakers, which like the Nexus 6 blast out sound from the earpiece and microphone slots. The WQHD (2560 x 1440) display is covered in super strong Gorilla Glass 4 and measures in at 5.7 inches diagonally. The back of the phone houses a black strip across the top which holds the flash, laser auto-focus and 12.3 MP camera. The black strip across the top of the backside seemed to be a concern for aesthetics for many potential users, but I personally don’t find it distracting one bit on this graphite version. The phone sits flat on any level surface and is a nice change from the rounded back of the Nexus 6. The Nexus 6 rocked back and forth when trying to use the device on a flat surface. In regards to the frost and aluminum colors, the black strip can look out of place, but honestly I did not think it was a distraction at all. Also on the backside of the phone is the new fingerprint reader. The fingerprint reader is a simple circle that is painted the same color as the rest of the phone. If you didn’t know it was a fingerprint reader, you would just assume it was apart of the design. 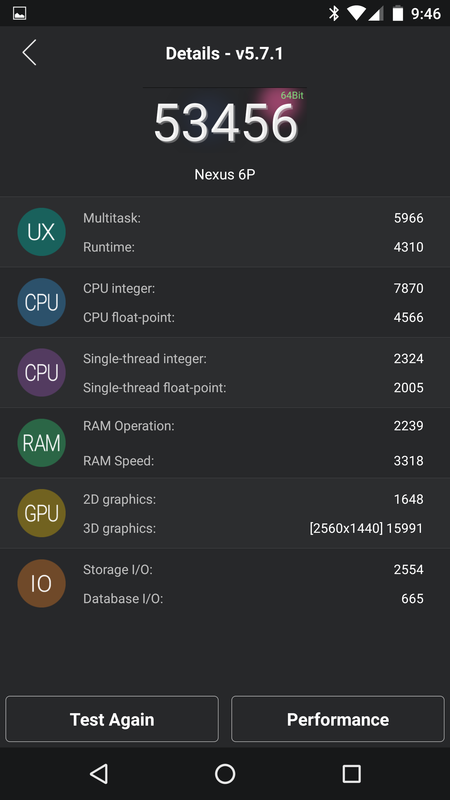 One nice tidbit I have noticed so far, is the weight of the Nexus 6P is distributed very evenly across the phone. This matters because it makes it very easy to hold one-handed for a large device. I actually found myself typing one handed, which I haven’t done in years, because my primary devices were Galaxy Notes which were awkward to hold. My hands aren’t large by any means, so this was a pleasant surprise. 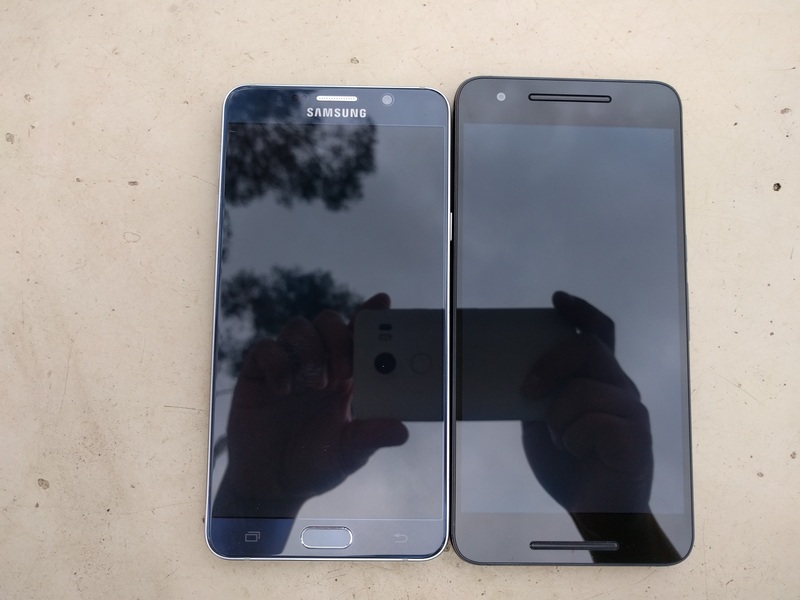 Samsung Note 5 on left and Nexus 6P on right. Very similar size. Both of the buttons, power and volume rocker, are placed near the middle of the right side of the phone. This makes it very easy to turn the phone on/off since you don’t have to change the placement of your hand to reach the top sides of the phone which is where large phones usually place the power button. Same goes for the volume rocker – the placement is just perfect. Overall, the design is top-notch and I can’t get enough of it. I can’t wait to see more Huawei designed phones to hit the US market. Google picked the perfect partner to make its first “Premium” smartphone as evidenced by the Nexus 6P. The reason why I put the fingerprint so high up on the initial impressions post is because this feature is going to be something everyone uses going forward. Google developed “Nexus Imprint” as a way to unlock your phone, turn on your screen on and breeze through checkout lines using Android Pay. The Nexus 6P asks you to set up a fingerprint, you can do more than one, when you set-up the device. All you have to do is place the same finger on the fingerprint reader five or six times so it can accurately read your fingerprint without worrying about placement. After over 100 unlocks, with wet fingers even, the fingerprint reader has yet to fail one time. It is so seamless, I don’t even realize the phone is locked because as soon as it reads your fingerprint, which is almost instantaneous, the screen turns on and is unlocked. As a back-up, if for some reason you can’t use your fingerprint, or if someone else wants to unlock your phone, you can always revert back to the more traditional pattern or pass code unlock method that you’re already familiar with. The fingerprint reader is so easy to use, I don’t see anyone leaving their phones unlocked anymore. I was one of those users who hated to type in pass codes, and also hated Samsung’s fingerprint reader because of the failure rate. I always thought Apple did the fingerprint reading the best on their iPhone, but I can now proudly say that Google OWNS every other fingerprint reader on the market. I actually thought Android Pay wouldn’t make much of an impact, because it’s pretty darn easy to pay with a credit card. However, after using Sndroid Pay, it is much easier to pay with a fingerprint and your smartphone. You don’t even need to pull out your ID or sign a receipt. The fingerprint reader with Nexus Imprint is a game changer and I expect everyone to be using it very soon. 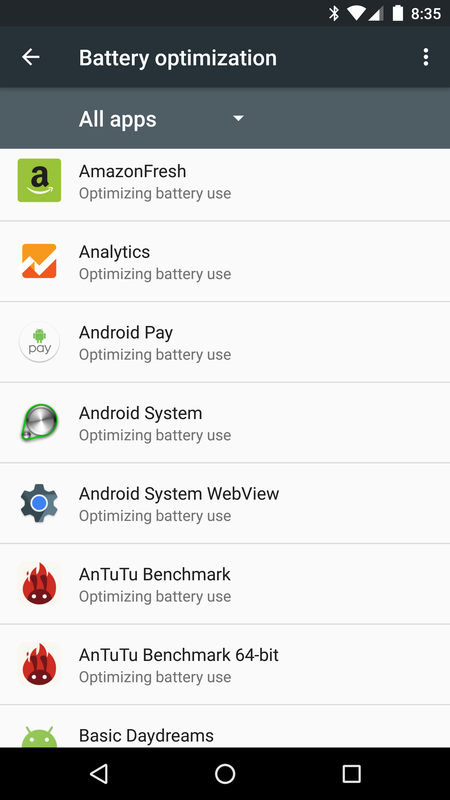 Android 6.0 Marshmallow claims to improve battery life. As a self-proclaimed power user, I was one of Samsung’s biggest critics for getting rid of the swappable battery option in their Galaxy devices because I need at least one full re,charge per day. Not because devices had battery issues, but I really do use my phones that much. The Nexus 6P comes with a large 3,450mAh battery, 450mAh bigger than the equally sized Galaxy Note 5. Google claims you can get 440 hours on standby, 23 hours of talk time, 10 hours of video playback or 100 hours of audio playback. I haven’t taken the time to measure specifics, but this is one of the best performing phones when it comes to battery life. I find myself looking for a charger less than ever before. And when it comes to standby, the power meter doesn’t drop when I leave it disconnected from a charger while I sleep. Other phones promise excellent standby time, but many rarely deliver. The Nexus 6P also comes with the new type-C plug, and other than having to change my cables going forward, I simply love this feature. With micro-USB cables, I might be in the minority here, I always felt like the charging port was fragile. That connector always scared me because I always feared I was going to plug it in at the wrong angle and break it. USB type-C does away with that fear and you can now plug in the cable without looking because it is completely reversible. The Nexus 6P also charges very quickly, with 10 minutes of charging providing up to seven hours of battery life. Between Marshmallow optimizations and USB type-C, I already feel like micro-USB cables are outdated and phones running on anything less than Android 6.o are ancient. Again, as a Samsung fanboy, I actually liked Touchwiz. I know that sounds crazy to most of you, but I found it useful. Yes there an abundance of useless features, but the useful features like multi-screen or the stylus outweighed the negatives. When I tried stock Android 5.0 on the Nexus 6 it proved to be boring and too simple for me. With the introduction of Android 6.0 and all of its optimizations, I now have a changed heart and now think TouchWiz is overdone. I was more annoyed with Samsung’s really slow updates, being even slower this year though, and lost all of my patience with them on the Note Edge. Stock Android Marshmallow doesn’t look any different, from what I can tell so far, than Android Lollipop. It performs buttery smooth on the Nexus 6P and the Nexus 5X. Not once have I experienced a single stutter or lag which is something I cannot say for any other device including the Note 5 and iPhone 6S. Considering I have only used the Nexus 6P for two days, I haven’t had enough time to play with the new software features like “Now on Tap” or “Direct Share”. I will get to those features in my full review in about a month. 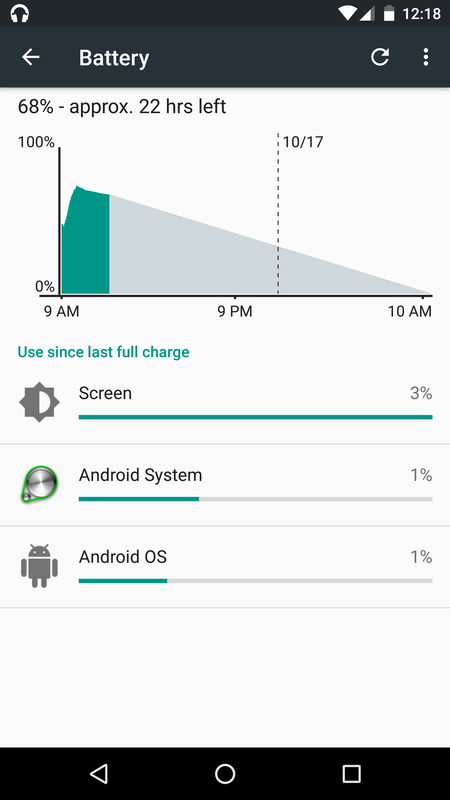 Overall, Android 6.0 Marshmallow is blazing fast and super stable and I love it so much I want to marry it. I’m probably the last guy who should be testing cameras at Androidguys.com as I simply am not good at picking up fine details. I think many cameras are great these days, with the exception of Motorola and mid-range to budget devices. Hopefully Josh Noriega, another editor at AG, will do his signature camera comparison in the near future. For a camera and using it over a weekend, I am more than happy with it and desire nothing more. Again, as a Samsung fanboy I am a display snob. I rarely find any display acceptable, other than what comes on Samsung flagships, because the latest Galaxy devices have the best displays using 2k resolution and OLED technology. The super AMOLED display Samsung uses is incredibly bright, has superior contrast ratios, rich colors and is very clear. Rather than try to beat Samsung at a game they cannot win, Google and Hauwei decided to use Samsung’s OLED displays in the Nexus 6P. Everything matches up in terms of display performance, with the slight exception that the Nexus 6P appeared less than the Note 5 in daylight. I couldn’t test this completely, as San Diego was cloudy all weekend which is a rarity around here. I still did not have any issues seeing the display under full cloudy conditions. Being a premium device, the Nexus 6P display measures up to its name. Nexus 6P on left and Samsung Note 5 on right under cloudy conditions. Picture taken with Nexus 5X. Many of you know Qualcomm ran into some issues with its Snapdragon 810 which lead to device manufacturers shying away from the high-end processor. This blunder helped contribute to Qualcomm’s struggles in 2015 and resulted in employee layoffs. Google and Huawei decided to go with the Snapdragon 810, but it wasn’t the same version that ran into issues. They used the Snapdragon 810 v2.1 which supposedly fixed the overheating and throttling issues. In my initial usage, I never found the phone to get hot or stutter. I wish Qualcomm would have named the Snapdragon 810 v2.1 something else like the Snapdragon 811 because people simply don’t know enough about the 810 to know there was an updated chip that addressed those issues. 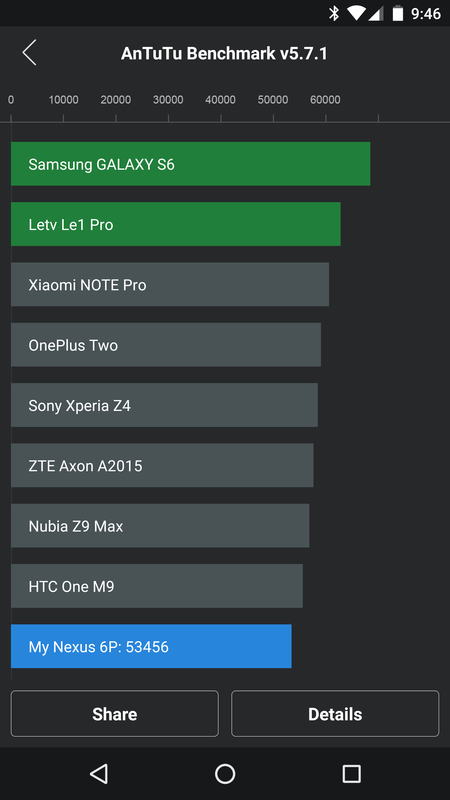 According to the Antutu benchmark test I ran, the Nexus 6P isn’t the fastest performer on the block, but Google wasn’t dumb enough to fall into that trap. Google didn’t see a need to put a v-12 engine in a golf cart, rather they built the Nexus 6P like a Porsche with balanced a balanced power-to-weight ratio, as this phone is designed to be an all-around performer. Not a drag strip car built for the quarter mile that needs to be towed to the track. Referring back to the software and the software optimizations, this is probably the quickest phone I have ever used. Antutu benchmark results fell in the range of 53k-59k. Nexus 6P flush speaker with display. It has been a long time since I have been excited about a phone and I am giddy every time I pull the Nexus 6P out of my pocket. In just two full days of usage, I am not longer a Samsung fanboy, but I still dare them to get my attention back. The Nexus 6P is a loaner from Google, and the day I send it back, I will already have a replacement Nexus 6P ready to go paid for with my own hard-earned money. 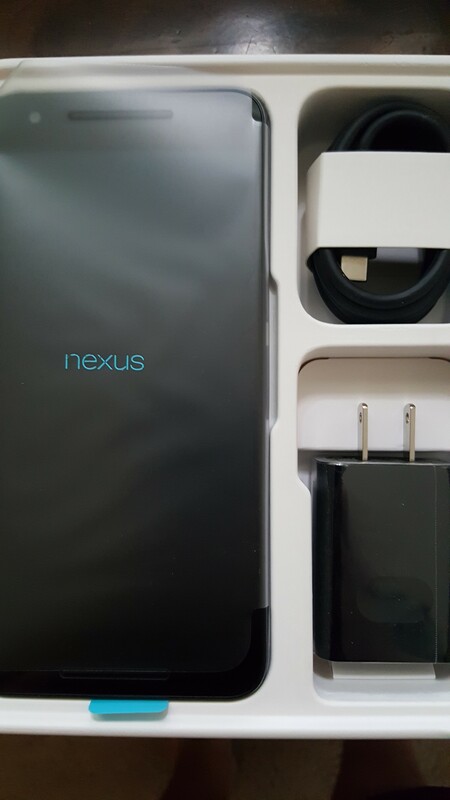 Other than having to upgrade my cables around my house to USB type-C, I cannot find a single flaw with the Nexus 6P. It is fast, has incredible software with no bloat, has a game-changing fingerprint reader, great camera, and best of all an incredible build. Starting at $ 499 for the base 32GB model with 3GB of RAM, you cannot go wrong with this most premium of phones in the Nexus 6P. You can order the Nexus 6P now at the Google Store, and if you have been looking for a new phone just get this one, you won’t regret it. Beware, shipping times are four weeks out and I suggest you get your order in sooner rather than later as I predict the Nexus 6P will sell in record numbers. Look for a full review in one month. Thanks for reading this initial impressions post. Please let me know your feedback in the comments section below. The post Nexus 6P first impressions(P is for Premium). 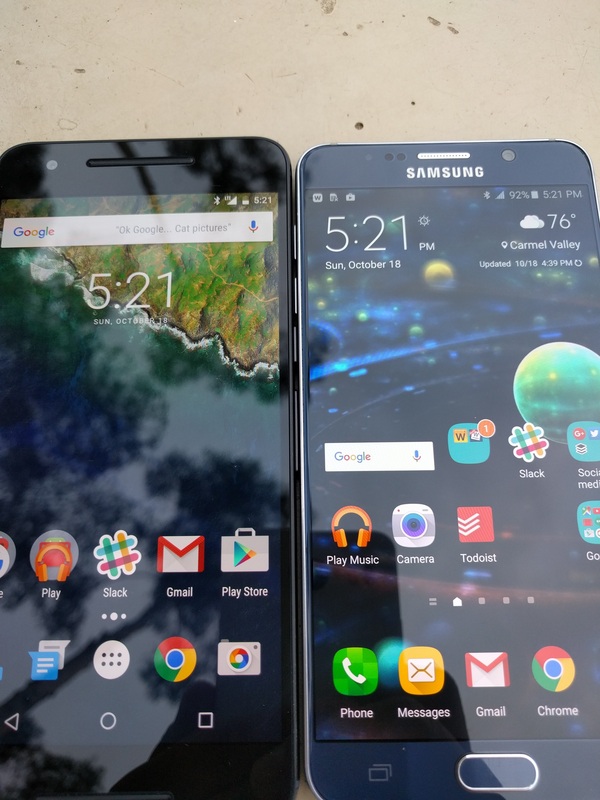 So far it is the best phone of 2015. appeared first on AndroidGuys.